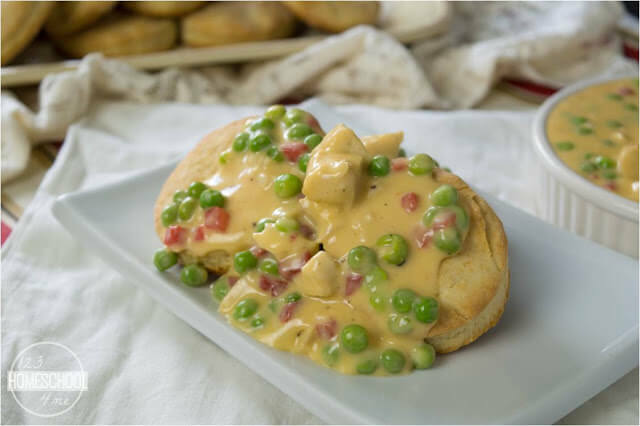 Looking for a delicious makeover of the classic Jazzed Up Creamed Chicken over Biscuits Recipe? You are going to want to check out our easy, creamy, delicious recipe. This Jazzed Up Creamed Chicken over Biscuits Recipe is my favorite comfort food and most requested dinner when our family visits from out of town! It takes the classic creamed chicken over biscuits and tweaks it to make it even better. Melt butter over medium heat. Add flour, pepper, and ground mustard and use whisk to cook for 1-2 minutes over medium heat until it smells nutty and there is just a hint of it turning light brown. 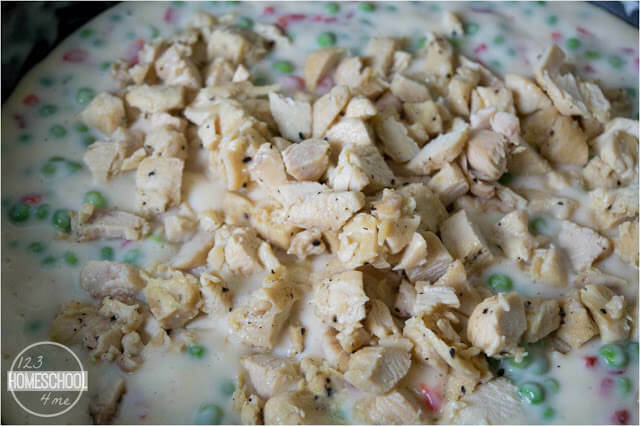 Add cooked chicken or turkey, peas, and drained pimientos and cook over medium heat until peas are softened and chicken is hot – about 10 minutes. HINT: Make it a quick dinner and pull chicken off of a rotisserie chicken or use leftover Thanksgiving turkey. 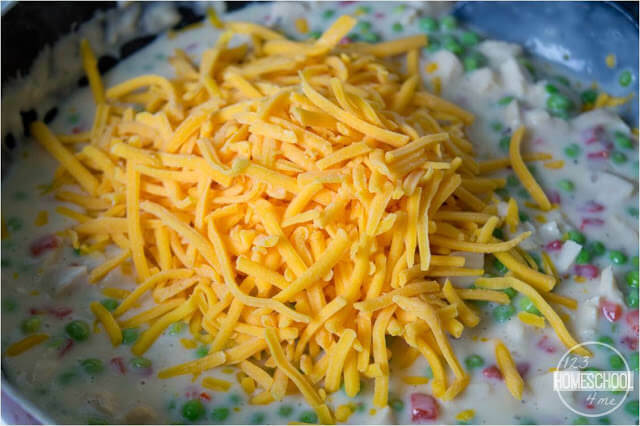 Add cheese; once melted it is ready to serve over biscuits. 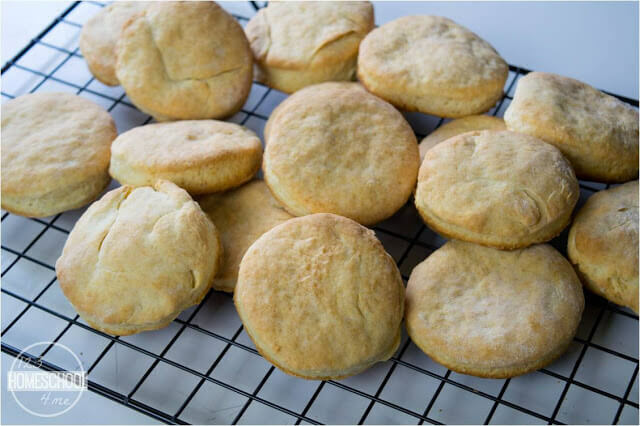 Serve with homemade biscuits; see our easy, delicious recipe below. Preheat the oven to 450 F. In a bowl cut the crisco (or butter) into the flour, sugar, baking powder, and salt. 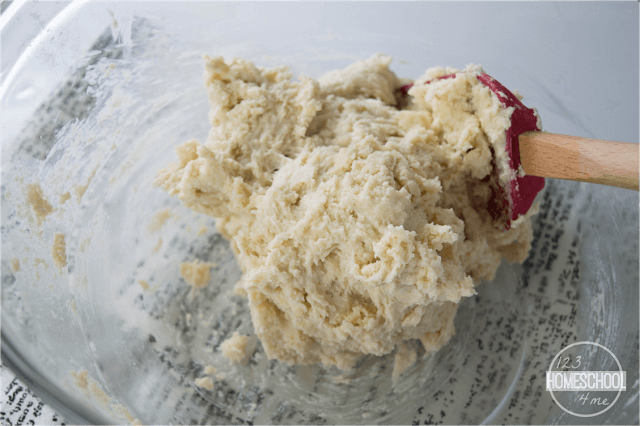 Turn dough onto lightly floured surface; knead 10 times. 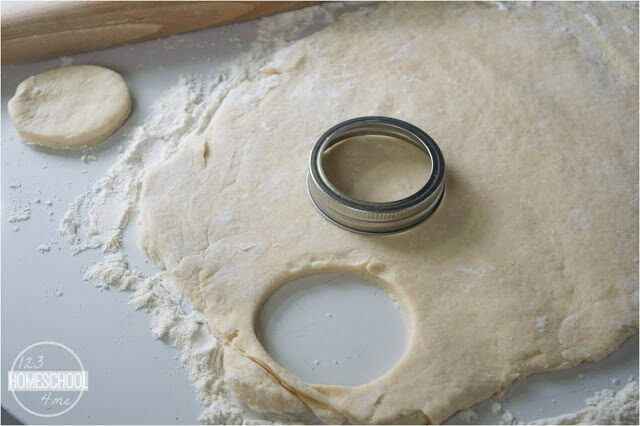 Roll ½” thick and cut out using a cookie cutter (I use the large lids from ball canning jars). Put on ungreased cookie sheet and bake 10-12 minutes or until just a hint of light brown. Serve warm. How pretty is that? We like to eat it various times throughout the year, but especially for Christmas because of the red and green. This recipe is so creamy with just right taste of Grandma’s home cooking mixed with a slight zip to make it have more intrigue. It is one of our all time favorite meals! 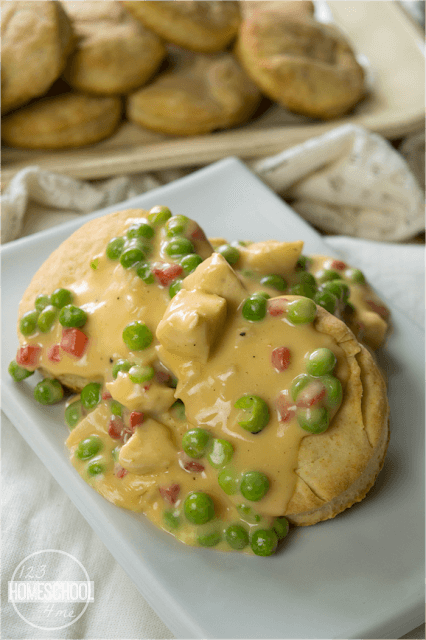 Looking for a delicious makeover of the classic creamed chicken over biscuits? You are going to want to check out our easy, creamy, delicious recipe. Cut shortening into flour, sugar, baking powder, and salt. Stir in milk. 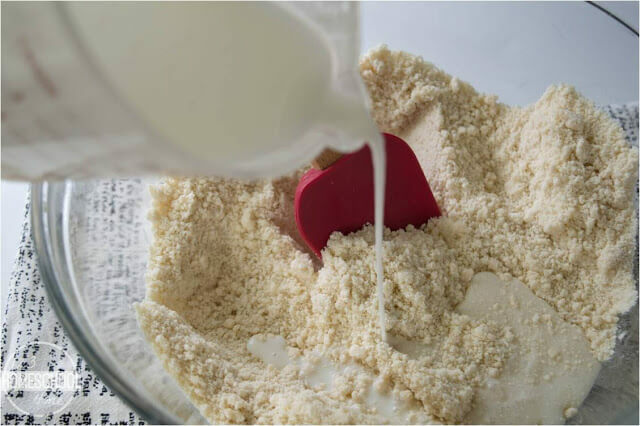 Turn dough onto lightly floured surface; knead 10 times. Roll ½” thick and cut out using a cookie cutter (I use the large lids from ball canning jars). Put on ungreased cookie sheet and bake 10-12 minutes or until just a hint of light brown. While the biscuits are baking, melt butter over medium heat. Add flour, pepper, and ground mustard and use whisk to cook for 1-2 minutes over medium heat until it smells nutty and there is just a hint of it turning light brown. 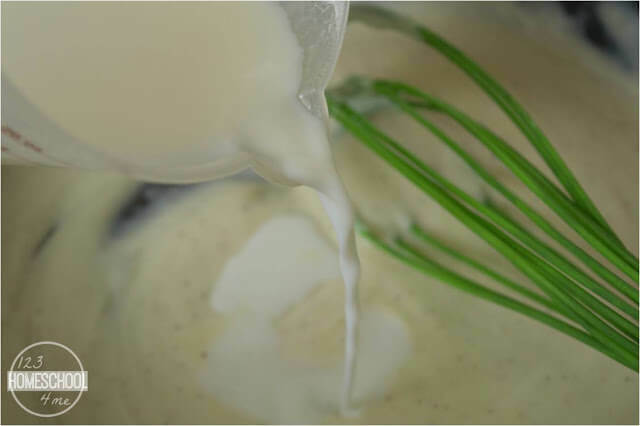 Slowly add milk, stirring constantly until it thickens, 4-5 minutes. Add chicken, peas, and drained pimientos and cook over medium heat until peas are softened and chicken hot - about 10 minutes.